Hudson County Consumers Brewing Co.
One of the most majestic of all beer posters is this one taosting the merits of the Hudson County Consumers Brewing Company. 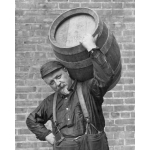 Organized in the summer of 1899, the Hudson County Consumers Brewing Company placed its first batch of beer before a thirsty public two summers later, in 1901. Response was good and the brewery operated successfully until Prohibition, when it turned to the manufacture of ice. It struggled along and finally closed down completely late in 1928. The sizeable plant of the brewery shown on the poster was located at 481-515 Summit Avenue, West Hoboken (now Union City), New Jersey. The property was acquired by the city of Union City in the early 1930s and the buildings were razed. Union City's Roosevelt Stadium was built on the site with WPA funds. It was dedicated in 1935 and is still in use.